Eighteenth-century England lacked the structure to take action against the injustices rampant in its society. Into this environment Charles Wesley was born. Sweet Singer is a musical which tells the story of this prolific poet and man of God. It presents some of Wesley’s best loved poems, such as "Hark! the herald angels sing," "Love divine, all loves excelling," and many more, which relate his reaction to an unjust world. 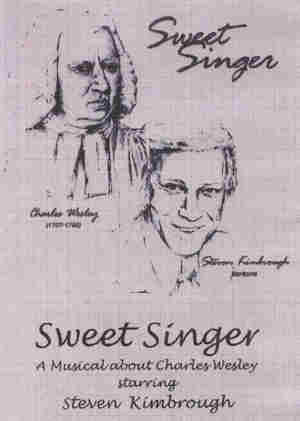 Sweet Singer is a one-person musical drama which deals with Wesley's struggle against poverty, reluctant acceptance of Holy Orders and life as a Church of England clergyman, adventure to America, opposition to slavery, social and spiritual reform, personal transformation, stormy beginnings of the Methodist movement, courage in the face of violence, family devotion and conflict, and poetic genius. “Sweet Singer is a grand experience of the best of the Wesleyan tradition in word and music. S T Kimbrough presents the sung, practical, lyrical theology of Charles Wesley in a way that is engaging, entertaining and edifying. A wonderful evening of worship, entertainment, humor, and theology all combined by a master of the Wesleyan tradition.” Bishop William Willimon, North Alabama Conference, United Methodist Church. “S T Kimbrough brings the hymns and ministry of Charles Wesley to life in his dramatic portrayal of the Sweet Singer of Methodism. The subtlety and strength of his voice provide a lyrical venue for appreciating not only Wesley’s song and life, but the continuing relevance of the poet’s message for Christians today.” C. Michael Hawn, Professor of Church Music, Perkins School of Theology, Southern Methodist University. With this version you can view the entire two act musical drama or present it in eight study sessions. A free study guide to accompany the study session can be downloaded free of charge from the Ecufilm website. For complete ordering information and links to Ecufilm, click the "Order Sweet Singer" tab above, click the image above, or just click here. CHARLES WESLEY is one of Christendom’s most outstanding poets. He wrote some 9,000 poems, many of which were set to music for use as hymns and are found in almost every English-language Christian hymnal regardless of denomination. He came by his gifts rightly, as his father, a sister and two brothers were poets. 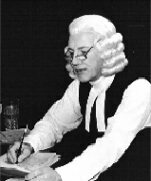 Charles attended Christ Church College of Oxford University where he and his brother founded the Holy Club, a small group of students later called "Methodists" because of their methodical concern for the daily routine of living, study and social service. 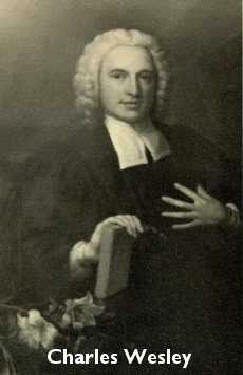 Although he and his brother, John, both clergymen of the Church of England, are best remembered as founders of Methodism, their friendship with the poor, opposition to slavery, emphasis on inward spirituality, witness of the Spirit, and social outreach formed a life-style of worship, inspiration and reform which is universal. Many of Wesley’s poems were born out of crisis, conflict, violence, oppression and opposition, and are still timely today. They have spread around the world wherever people suffer, rejoice and worship, for their message of self-giving love, as Wesley experienced it in Christ, redeems the time and those who sing them. A press release suitable for assisting in publicizing the performance. Comments on Sweet Singer by theater critics. The order of the musical numbers in both acts. The words to two songs: Nancy Dawson and Listed into the Cause of Sin. Biographical descriptions of the artists. The items needed for the performance of Sweet Singer.